Here’s a sneaky look inside Jaguar’s F-Pace crossover. Snapped out and about testing, our spies have managed to get a clear view of the upcoming 4x4’s centre console and touchscreen tech - and first confirmation there will be a manual transmission available. 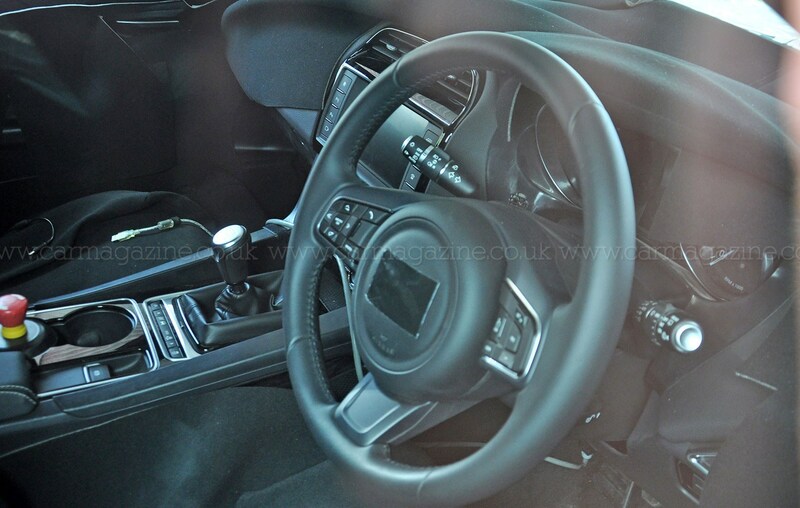 What can we tell about the new Jaguar F-Pace interior from these spyshots? Despite plenty of fabric cladding across the doors and upper dash to disguise the finer design points, there's plenty to see here. Not least of which, the presence of a manual gearlever. Despite the popularity of auto transmissions in the SUV market, rumours have persisted from the start that F-Pace would feature a manual gearbox option - partly to fit in with the car's projected image as a sporty, driver-oriented model, and perhaps partly to help establish a decent low watermark for the range's CO2 emissions. The F-Pace will be available with the same Ingenium diesel engines as the Jaguar XE and Land Rover Discovery Sport, both of which are available with manual transmissions. There's a clear view too of Jaguar Land Rover’s latest-generation InControl touchscreen multimedia system, as seen in the new Jaguar XF saloon, Jaguar XE saloon and Land Rover Discovery Sport. Hardly a surprise, of course, but it’s good to see the F-Pace will leave behind the clunky infotainment interface older Jag models have been lumbered with for some time. Unsurprisingly, the majority of the interior architecture and switchgear appears very similar to that of the platform-sharing new Jaguar XF. The instrument panel's different, though - looks like the original Jaguar C-X17 concept car’s sports car-style twin-dial set-up has been retained. If you're wondering what the big red mushroom in one of the cupholders is all about, it's an emergency shut-off. A pre-production Jaguar XE we tested sported the same thing as a legal requirement since its ECU hadn't yet been fully approved. An eight-inch touchscreen based on the same software the iPhone uses, that’s far faster and more responsive than previous-gen JLR systems and with much smarter graphics to boot. In line with similar systems being adopted by other manufacturers, the system’s compatible with both iOS and Android smartphones with various apps available – including, in time, the possibility to unlock the car or remotely set the climate control. Expect the F-Pace also to feature a head-up display, traffic-sign recognition and blind-spot monitoring. Our spies have also captured new snaps of the car as a whole too. Notice the all-season tyres, commonly fitted to Land Rover models - looks like F-Pace could be following suit. Click here to see further exterior spy shots of the pre-production Jaguar F-Pace.